Looking at the matrix to the left, what image completes the pattern? This is a matrix reasoning puzzle. 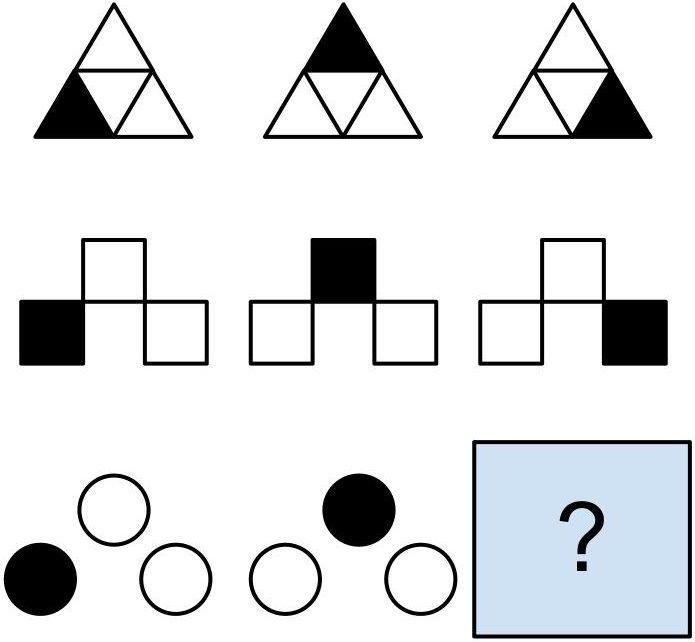 These puzzles tap into basic facets of human intelligence: the ability reason abstractly—to see meaning in complexity, complete patterns, and solve novel problems. Our project is crowdsourcing the design of a set of matrix reasoning puzzles. This is a competition, so winners will receive cash prizes and co-authorship of a scientific paper. We have finished collecting the puzzles and the contest submission window is over. We received a total of 661 submissions, of which about 341 fulfilled all of the criteria for validity. We have started evaluating the difficulty of the puzzles and are currently in the process of redrawing the items to guarantee a consistent artistic style, quality, and layout. The final step will be validating the difficulty of the puzzles against existing intelligence tests. We will then proceed to write the paper and make the database of puzzles available to researchers free of charge. Please check back for further updates.